Egypt is a land of superlatives. One of the three oldest civilizations in the world, the land of the pharaohs experiences a convergence of culture and history both ancient and modern. After our first day in Giza seeing all that the west side of the Nile and ancient Cairo had to offer, we set off into modern Cairo on the eastern bank. 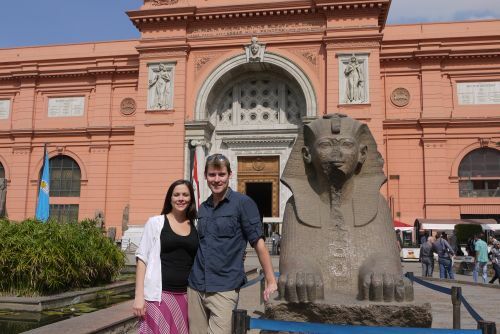 Our first stop in Cairo was the Museum of Egyptian Antiquities – aka the Egyptian Museum. Our tour guide Mahabeeb strategically positioned the Egyptian Museum as the first stop of our day to provide us with as much time as we wanted to experience this amazing archive of world heritage as we so chose. Home to over 120,000 various pieces of Egyptian history, the museum is overwhelming and reminded me a bit of the British Museum in the depth of its collection. They unfortunately require everyone to check their cameras at the entrance as no photography is allowed. The bottom floor was primarily dedicated to “heavy” and “large” pieces – items not easily trucked up to the second floor. Thus most of the immense stone carvings and statues remained downstairs. My favorite piece was a carving of a Prince Rahotep and Wife Nofret. 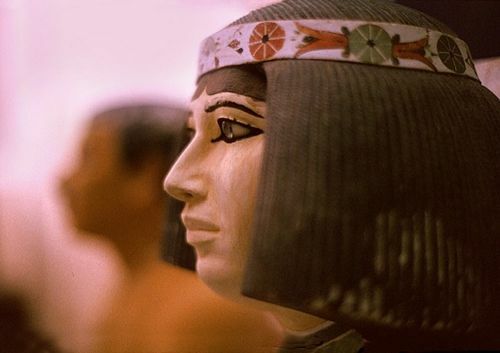 Life sized, it wasn’t very large by comparison to a typical sculptures of pharaohs (bigger statues typically equated to statements of wealth or enlarged egos). Unique to this sculpture where the eyes of Rahotep and Nofret. Typically poached by tomb robbers, this was one of the few statues containing the original eyes sculpted out of precious stones to exactly imitate the eyes of the pharaoh they represented. They were scary real – pretty amazing for something four millennia old. Next we ventured upstairs to see some of the most prized possessions of the museum. In accordance with their strong belief in the afterlife, the wealthiest ancient Egyptians and in particular the pharaohs and their family members would be buried with their most prized personal possessions. An archeologists’ dream, most of the items upstairs in the museum were recovered from various ancient Egyptian tombs and provide amazing insight into the life of this ancient civilization. From the ornate jewelry to dolls and figurines depicting scenes from everyday life in ancient Egypt the collection upstairs was an amazing glimpse inside one of the worlds oldest civilizations. 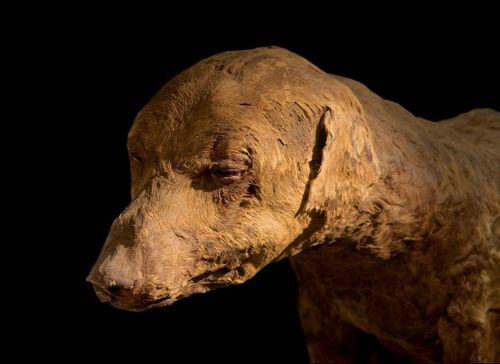 One of my favorite exhibits upstairs was the mummified animal room filled with the mummified pets of various pharaohs. Included where the mummified remains of a horse, a goat, several cats, a dog, a monkey, a giant five foot long fish, and the centerpiece a twenty some foot long crocodile – very cool. Saving the best for last, the world-renowned exhibition of artifacts from the tomb of King Tutankhamen was our final stop. The King Tut exhibit is unique in that it is a complete collection of a burial tomb and includes over 3,500 unique artifacts. While the Golden Mask of King Tut made out of 11 kilos (23 pounds) of pure gold and in the exact likeness of the 19-year-old boy king is the most famous piece of the collection, what most impressed me was the serious of sarcophaguses used to house the mummified remains of King Tut. A total of nine chambers in all, each sarcophagus was covered entirely with gold and sat snuggly inside the other like a massive serious of Russian nesting dolls the largest of which was the size of a 9’x9’ room. The serious of five golden shrines, one stone sarcophagus, and three coffins were so large in fact that it occupies a full hallway of the museum. It was something that can truly only be seen in person to fully appreciate and marvel in. Wow. After spending all morning at the museum Mahabeeb was prodding us along as he had many other sites on his agenda for us to visit that day. He told us that being American’s he only expected us to stay in the museum for about an hour or so but after three hours in the museum he thought we behaved more like Germans – funny. Exiting the museum we immediately noticed the burnt out shell of a building. After asking Mahabeeb what it was we quickly learned that we were standing in Tahrir Square, ground zero of the recent Egyptian revolution protests. The building we were looking at was the shell of the former Mubarak political headquarters building burnt to a crisp during the riots. 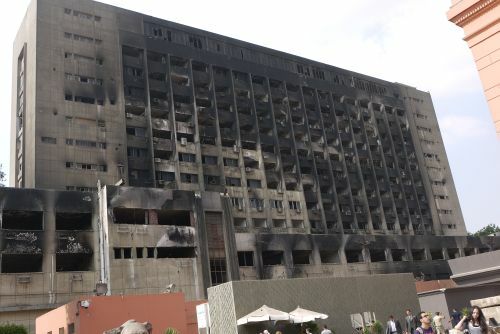 Mahabeed said that they would most likely leave the building in its blackened state as a reminder of the infamous Mubarak regime and what the revolution was all about. 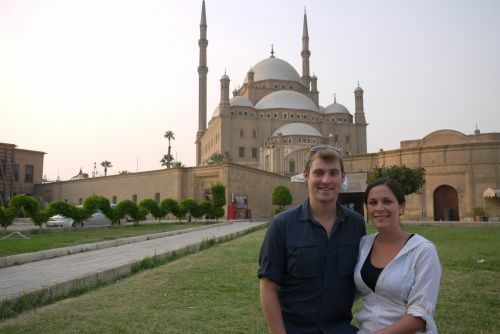 After reveling in the significance of our surroundings for a bit, we jumped into our tour van and headed toward our next destination, Coptic Cairo. Coptic Cairo sits at the heart of the ancient city center of Old Cairo. 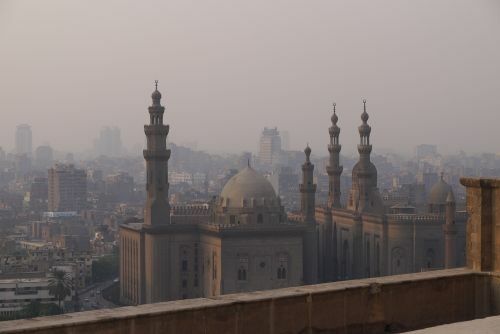 Islam, Judeism, Roman Catholisicm, and Coptic Christianity collide in Coptic Cairo having lived for the most part harmoniously side-by-side one another for the past few millennia. A few days prior to our arrival in Cairo the Egyptian military had unfortunately shot and killed several Coptic Christians who where protesting in Tahrir square. 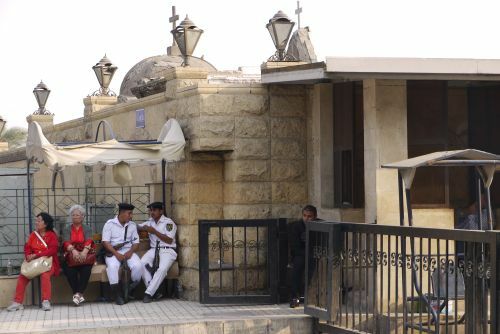 Trying to do some damage control against any further escalation, the gates to Coptic Cairo where heavily guarded as the military sought to protect the lifeline of Egypt’s economy – tourism. AK47’s in hand, local law enforcement gave us a once over and waived us through. 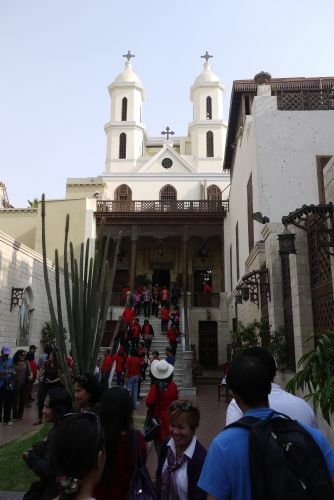 One of the main attractions in Coptic Cairo is the Hanging Church, the center of Coptic Christianity and hope to the Coptic Pope. Around the corner from the Hanging Church is the Roman Catholic Saints Sergius and Bacchus Church, home to the purported hiding place of the Holy Family during their flight from Israel to Egypt as they sought to escape persecution from Roman Emperor Herod. As we drove away from Coptic Cairo and weaved our way through the city streets of the modern day city, Al and I quickly thanked God that we had a driver. 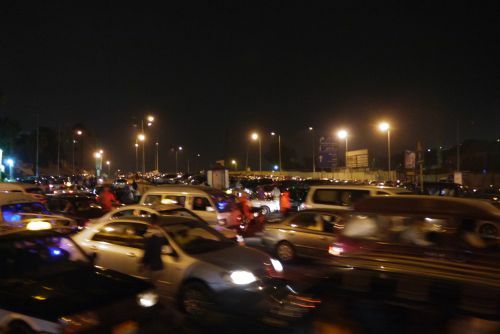 Driving in Cairo is INSANE. Lanes do not exist. The closest thing I can equate it to would be a motorized school of fish, each vehicle zooming along inches from the next. The horn becomes an extension of the vehicle as it communicates in its own special language with the cars on either side. 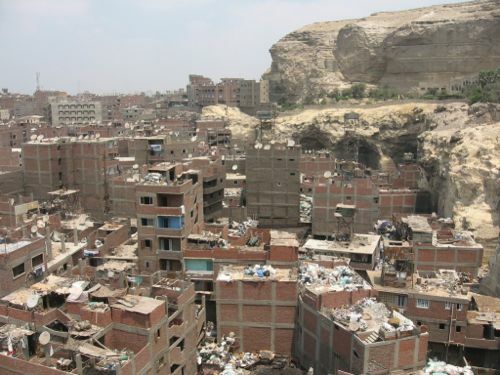 With an unofficial population of about 24 million, the city is the largest in both Africa and the Middle East. And with car ownership on the rise, our driver Nasir confirmed that the traffic in Cairo has become almost unbearable over the past few years. 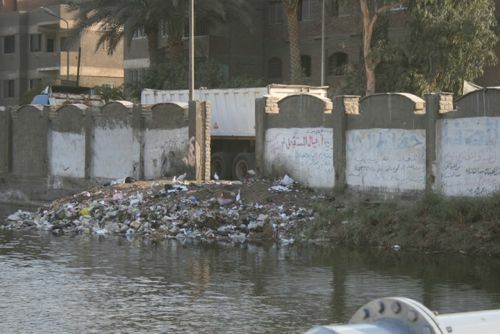 The other major downside to Cairo is the trash. Piled high underneath the highways are two story tall mounds of trash. The banks of the irrigation canals running throughout the city are also littered with rubbish, mounds of used building materials, and various dogs rummaging through the waste in search of their next meal. It is truly and eye soar on what would otherwise be a vibrant modern city. 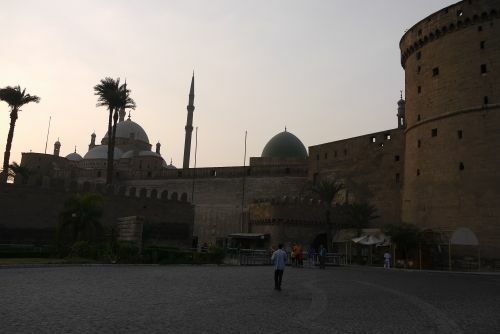 After nearly an hour on the road, we arrive at our next destination across town the Cairo Citadel and Mosque of Muhammad Ali. The citadel historically served as the city fortress and royal residence since medieval times. A giant structure surrounded by an extensive wall, the citadel is perched atop Mokattam hill, one of the highest vantage points in all the city. 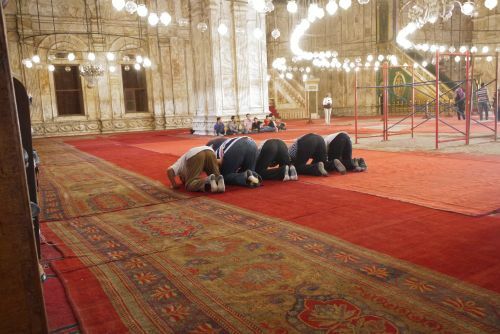 Under Ottoman rule in the 19th century, the then Ottoman ruler Muhammad Ali Pasha commissioned the construction of the largest Mosque in Egypt. The Muhammad Ali Mosque is in the Ottoman style with its central dome surrounded by four semicircular domes and is certainly reminiscent of the Hagia Sofia and Blue Mosque of Istanbul. Our final stop in Cairo was the Khan el-Khalili Souk. One of the largest Bazaar’s in the Arab world its flavor was very similar to the bazaars we experienced in Turkey and Morocco. The main difference however was the demeanor of the shopkeepers. While the bazaars in Turkey were fairly relaxed, and the Moroccans were very direct but not too overbearing, the Egyptians stepped over the obnoxious line by two or three steps. Walking down the streets of the bazaar EVERY single shopkeeper would heckle you into looking at his goods and occasionally they would gently grab your arm in an attempt to physically slow you down so they could grab your attention. With a full day behind us, Al and I spent an obligatory half an hour touring the streets of the bazaar before throwing the towel and calling it a day. With our bags already in the tour van we headed toward the train station to board an overnight train to Aswan. 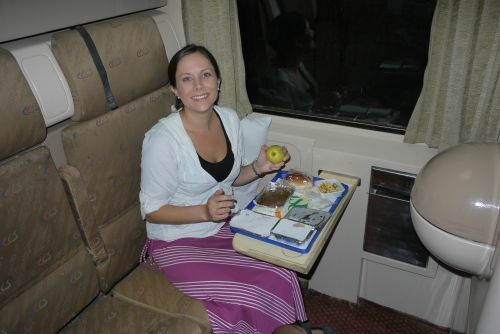 Never having ridden a night train before we had no idea what to expect, all we really knew was that the train was 14 hours and got us to Aswan, the next city on our itinerary. Tamer, our tour director and primary contact with Memphis tours, kindly waited with us at the train station. During our two-hour wait at the station we began to see a few trains pass and Al and I got nervous. These less than modern “beauties” had certainly seen better days of service and were so loaded down with passenger that they literally had people hanging out of the door wells. Hoping with all our might that this was not the type of train that was ahead of us we sat and waited. Finally our “sleeper” train arrived and much to our relief it was nothing like the regional trains we had been watching pass though the station. Upon entry we were greeted by the steward who instructed us that he would be serving us dinner and breakfast as he walked us through the ins and outs of our private two-person cabin complete with two bunks and a sink with running water. Each train car had its own steward, who was in charge of the eight or so cabins located in that car. 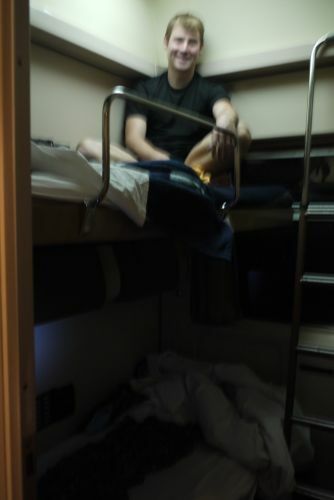 Exhausted from our full day of Cairo site seeing, Al and I laid down in our bunks after dinner and quickly dozed off to the gentle sounds of the clickety clack below us as the train rumbled toward Aswan. Really enjoying following your adventures! It looks like you’re on your way to Uganda. We’ll be there Nov. 30-Dec. 11. Are our paths going to cross? Would love to see you and get you to work with us! Let me hear! What an exciting trip to Egypt. I would have loved to see the museum in Cairo. Thanks for keeping us posted on your travels. Happy Thanksgiving. Hope you can find some turkey and dressing to eat on Thursday. Cheers!